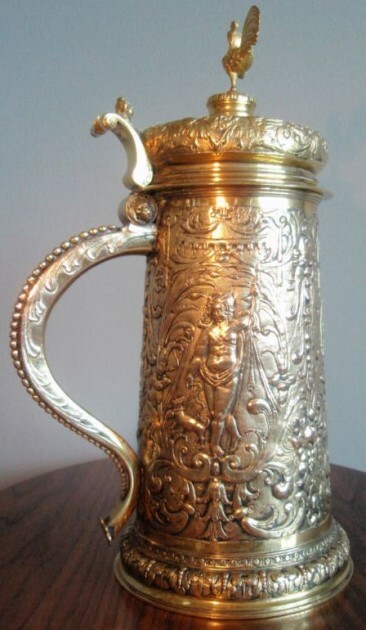 Most likely an Elkington (England) tankard. Eagle, Imperial German .….used after the unification of Germany in 1871 after the Franco- Prussian war. 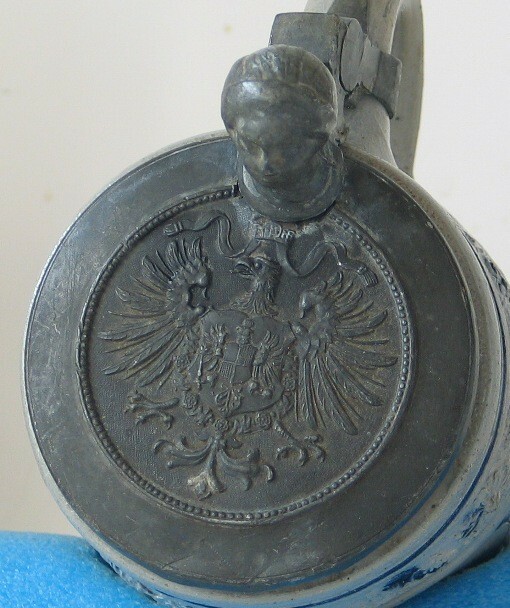 An example of the Imperial Eagle as shown on a pewter relief lid. This lid had been placed on a much earlier Westerwald stein, so it is obviously a later addition. 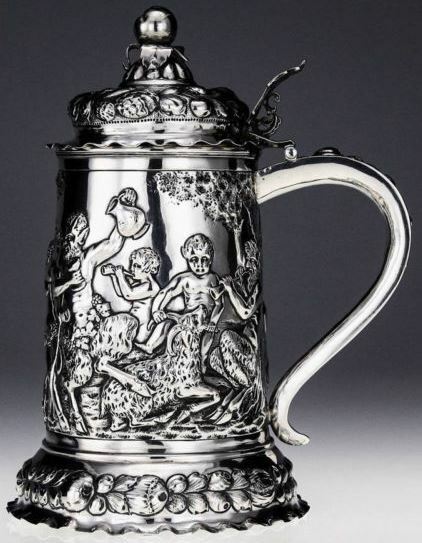 Eagle spouted steins – Not to be outdone by the silver and pewter-smiths who made these and others shown under “Adlers,” other companies had to jump on the wagon too. See those servers posted under “Adlers” also. 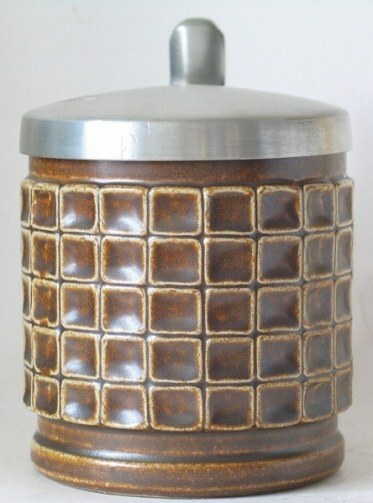 Eagle spouted Gerz Art Deco server, 3 liter, mold number 1396. Copper eagle server. 10.5 inch. Bavarian. Ca 1880-18=9120. 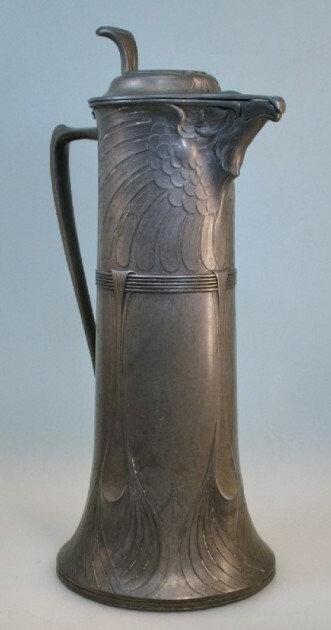 The eBay seller called this the Imperial Eagle – which it is not as there is no smaller eagle on its chest. Eagle wings open – See: Spread Eagle, this Compendium. Early ware – ( V & B Mettlach,) A generic term used mostly for products produced by V & B Mettlach, or in other V & B factories prior to say 1880, when the “Golden Age” of stein production took off. There has been some recent and very worthwhile discussions / articles that a lot of “early ware” that previously was thought to have be Mettlach was not !” (Jan. 2012) and in fact a couple of other companies were involved. 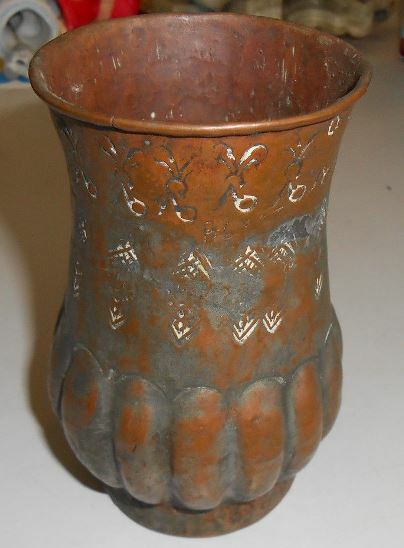 Another V & B “Early ware” stein- Ende 19. Jh. 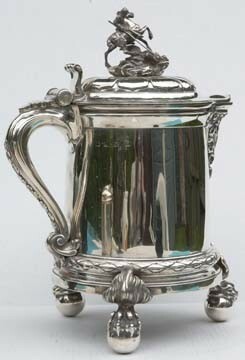 (End of the 1800’s) Lots of early ware steins / vases / etc., had silver luster applied to the relief vines and leaves. It wore off rather quickly, say in a hundred years or so. This Gambrinus relief stein above shows silver luster as accent to the design..
Earthenware (used the same as” Pottery”) – A non-vitrified (porous) ceramic, kiln-hardened at 850°C-1000°C. The stein requires glaze to become non-porous. 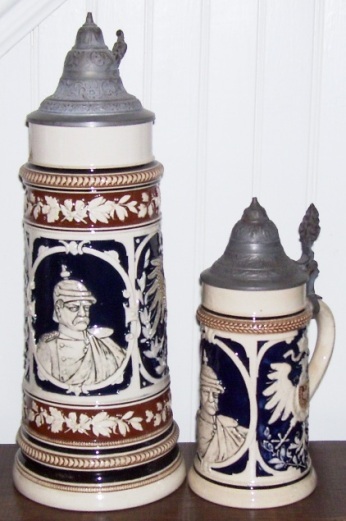 Shown: Two (German) earthenware steins made for the Standard Brewery Co.’s (Baltimore, USA) line of “Bismarck Beer.” According to an 83 year old Baltimorian, (in 2013) these were given out as mugs (for smaller orders) and then steins for larger amounts of beer ordered from the bars in B-town. True ? Why not ? [L] stein is 13.5 inches tall. 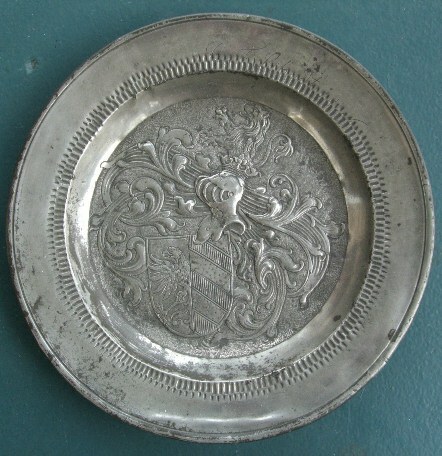 Edelzinn — Display pewter cast in relief; used since the 19th century to describe German and French relief pewter of the 16th and 17th centuries. Eggerman – A very famous Bohemian glasshütte. 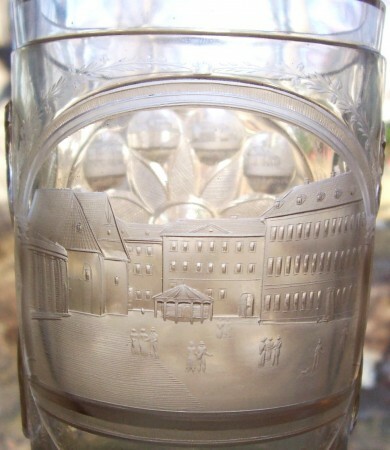 The inventor of several early glass decorating technology, Mr. Friedrich Egerman (1777-1864) had his glasshütte in Novy Bor. Thanks to his talent and diligence he achieved revolutionary discoveries. 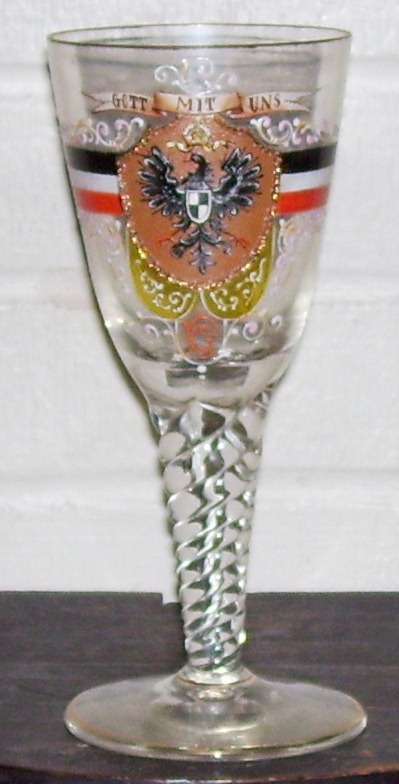 His ruby staining process was the first one to use motives of a shell, stag and the chateau and his staining and engraving technique has been adopted as the name Egermann glass forever. 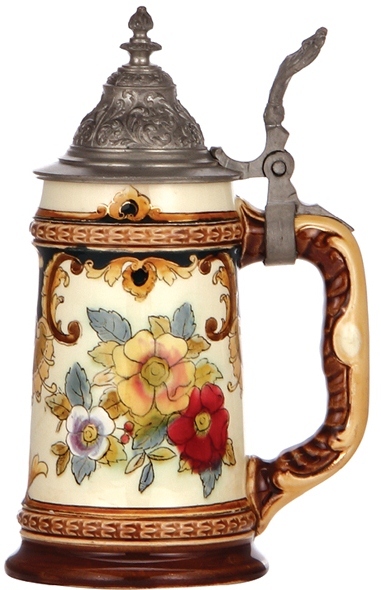 The firm produced many varieties of steins and other drinking vessels. Most of the green glass steins are distinguished due to their very dark green colored glass (as opposed to Theresienthal’s light yellow green) and very bright enamels. Lost of yellows as seen above are dominant ▲. 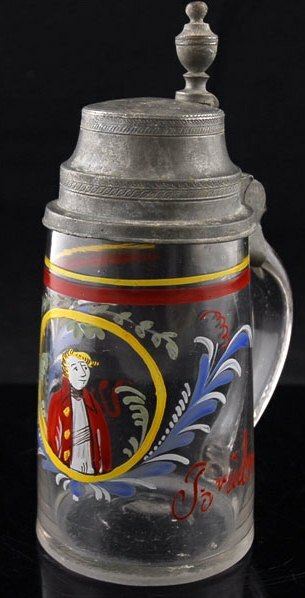 Shown ▲: A 1/2 liter enameled armorial stein. Coat of Arms unknown, and is probably fictional. Ca 1880’s. 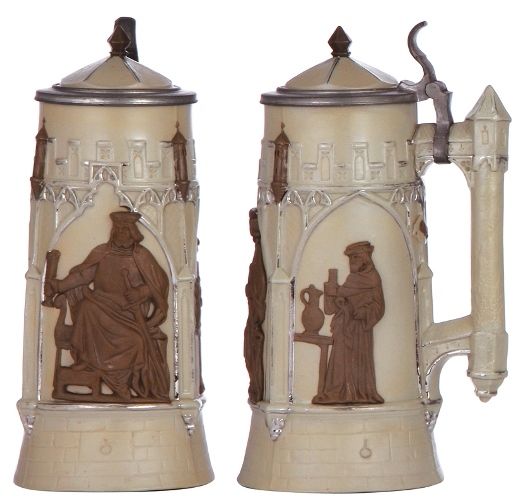 Shown below ▼: One of Eggerman’s most sought after beer steins. Lots of different work on it.Ca. 1890 [RFA]. Eight hundred silver (.800) – The German standard for silver, but only after 1 January 1888. Prior to that they used the “Loth system”, which was based on 16th’s = 12 Loths would be .750 silver content; or 750 units of silver per 1000 parts total. Sterling is 925 parts per 1,000. 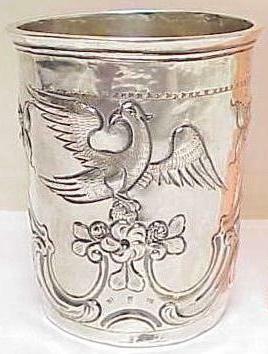 Shown: An .800 silver coin stein from the 1920’s . It also carries the “Crescent” and the ” Crown” , all required marks . [FWTD] This great piece was sold to me as a “Humidor,” from a Georgetown, D.C. dealer, as it’s previous owner had kept his cigars in it. Gotta love it! 1888- January 1, 1888 – The date the new German Imperial Standard for silver became in effect. It required  the purity of the silver to be marked in a 1000/th system. For example .800 equals 800/1000 pure silver (and .200 alloy, usually of copper.) Prior to that Germany used the “Loth” system, based on 16ths, = 12 Loths would be .750 silver content; or 750 units of silver per 1000 parts total. (Sterling is 925 parts per 1,000.) a stamped crescent moon, and  a small stamped “Imperial” crown. the makers mark or name. 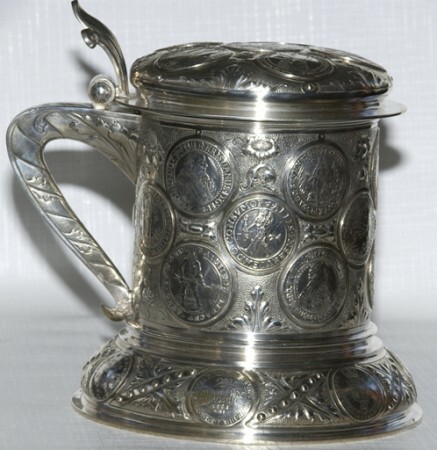 This law was passed on 16 July, 1884 and lots of silver-smiths started using it before the effective date, so one may find steins / items dated 1884- – 87, with the new marks. 1888 – The year of the three German Kaisers – 1888 was quite a year for the German Aristocracy and one that sent Germany headlong into a disastrous course of events. The Year of the Three Emperors, or the Year of the Three Kaisers, (German: Dreikaiserjahr; of “Drei”=Three, “Kaiser”=Emperor, “Jahr”=Year) refers to the year 1888 during the German Empire in German history. The year is considered to have memorable significance because of the deaths of two German Emperors, or Kaisers, leading to a rapid succession of three monarchs within one year.The three different emperors who ruled over Germany during this year were Wilhelm I, Frederick III, and Wilhelm II. The mnemonic “drei Achten, drei Kaiser” (English: “three eights, three emperors”) is still used today in Germany by children and adults alike to learn the year in question. Also see: “Three Kaisers, The” in this Compendium. Eihring, Heinrich – Modern designer for R.Merkelbach / Goebel. Eisenbahn (Railway) Steins [but not Reservist’s Eisenbahns] – Mostly occupationals. 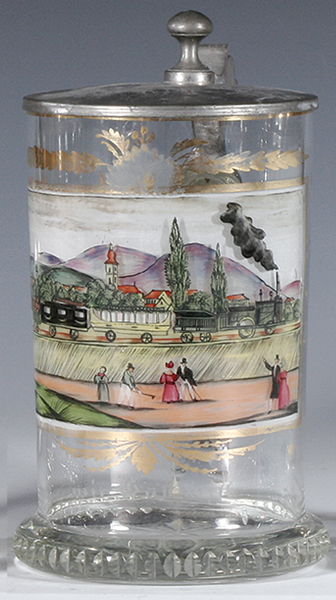 Shown: A Circa 1840’s Bohemian clear blown glass stein with enameled steam engine and cars. Quite a sight back then! 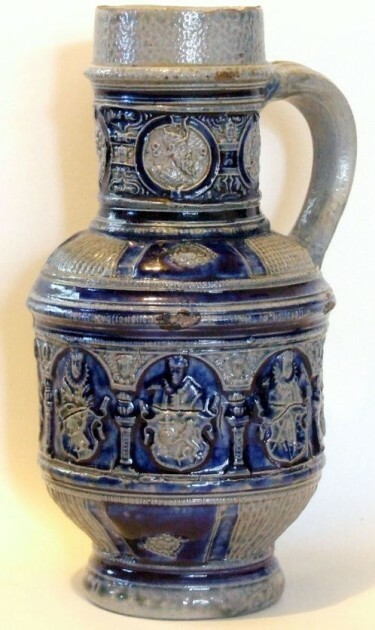 A Westerwald “Holy Roman Emperor’s Elector’s jug.” The originals are very rare, and this one is dated 1589! It has the initials IE for Jan Emens Mennicken; 15 & 89 in relief roundels at the top. The electors are holding shields with their respective Coats of Arms. 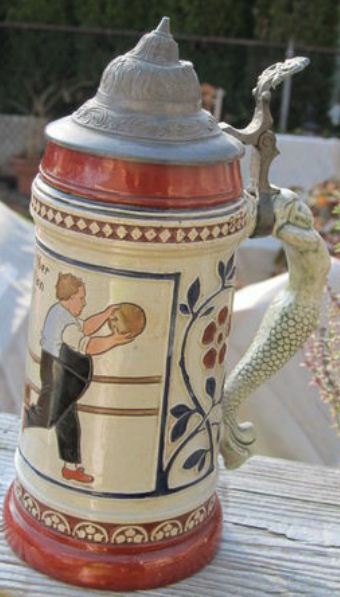 The motif of this stein has been reproduced and reproduced …….to this day! 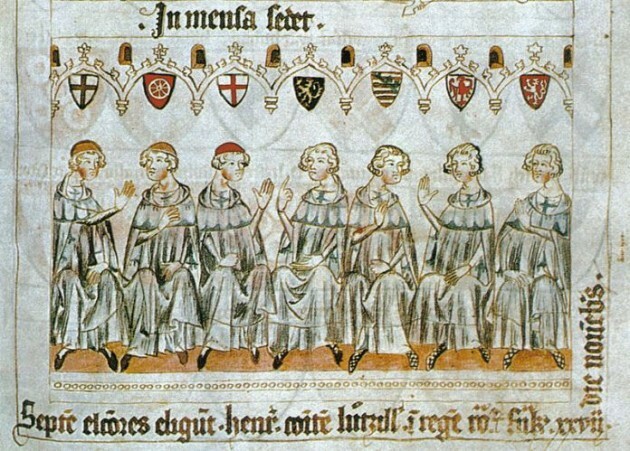 In the 13th century the right of election for a time exercised by all the princes of the empire, became limited to seven holders of the highest ecclesiastical and civil offices. Six of these were the Count palatine of the Rhine, the Duke of Saxony, the Margrave of Brandenburg, and the Arch-Bishops of Mainz, Treves [Trier] and Cologne. For some time there was doubt as to the seventh elector. In 1273 the duke of Bavaria claimed the place, but in 1289-90 the King of Bohemia was made the seventh elector. In 1623 the duke of Bavaria was added to the electors and in 1692, Hanover was made into a ninth electorate. In 1777 the number was again reduced to eight, the Bavarian electorate falling to the Elector Palatine. Their powers came to an end in 1806 when the empire was dissolved by Napoleon, but the title continued in use until 1866. 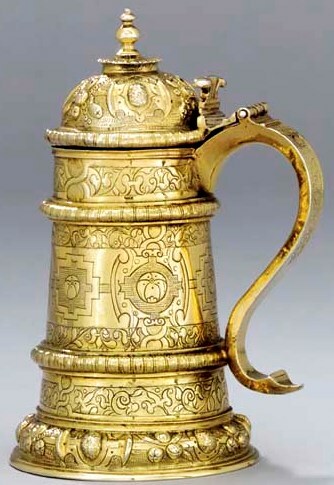 Elector’s cup – A German to English misnomer; as these are actually Humpens. Shown: A very modern replica of one for the Elector of Saxony. 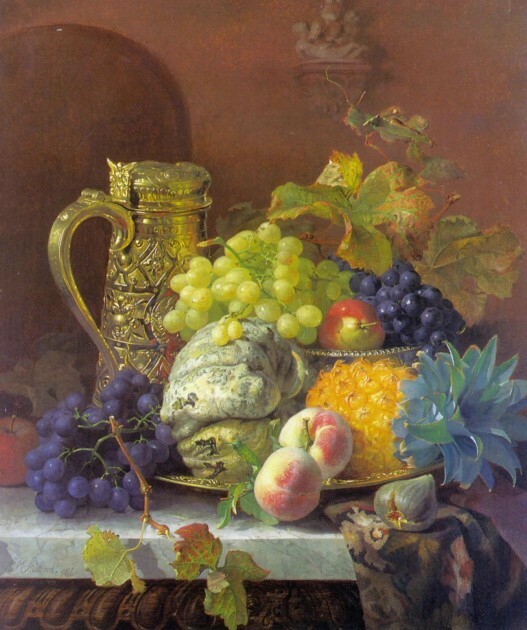 The reproductions that Heckert and others produced in the 1800’s have become so popular (and expensive) that the German glass factories started remaking these again in the late 1900’s. 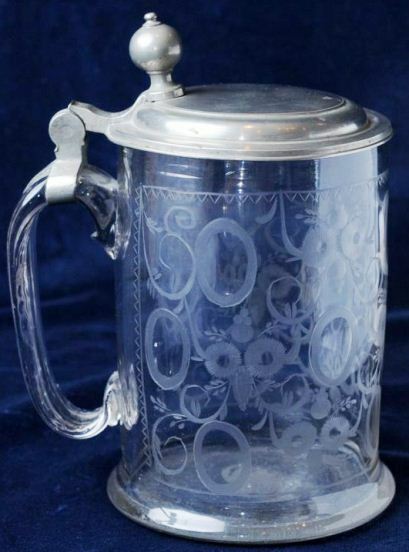 Electroplated steins – Most often done in silver. 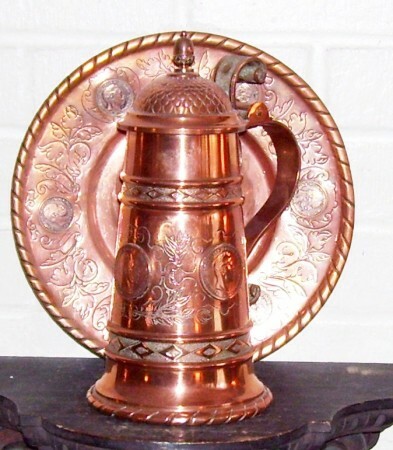 Vessels produced by immersing a (copper based mostly) stein in a solution with silver nitrates. An electrical charge is produced inside the tank and the silver molecules collect on the copper base. The piece is then polished, but ends up having a slightly different tint than Sterling silver. 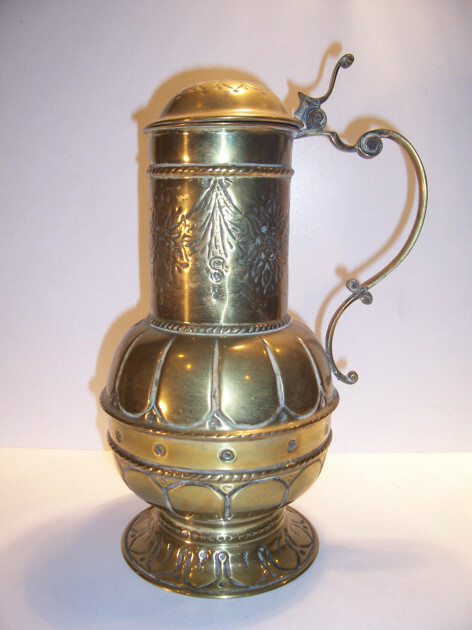 Electrotype — A copy of an art object produced by electroplating an impression of the original, then filling in the metal from the rear, the exact opposite process of electro-plating. Used in the nineteenth century to reproduce antique objects a lot of old “master pieces” were copied in this manner by Elkington and Co. They can be determined usually by the roughness in their bases, which were not finished / buffed down as E-P wares were. These are still usually expensive when found. 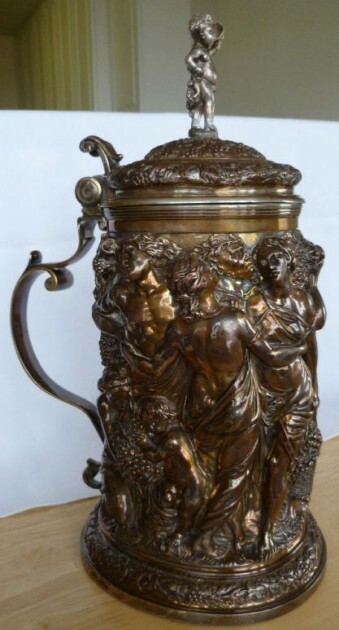 Shown above ▲: Elkington Electrotype tankard, circa 1860, dancing classical figures amid grapevines. The finial is an infant Bacchus. Height is 11 1-2 and it weighs 4 1-2 pounds! Below ▼: The inscription found on some of Elkington’s copies of older steins that states where and what the piece was copied from. Elfenbeinsteinzeug, (Germ.) 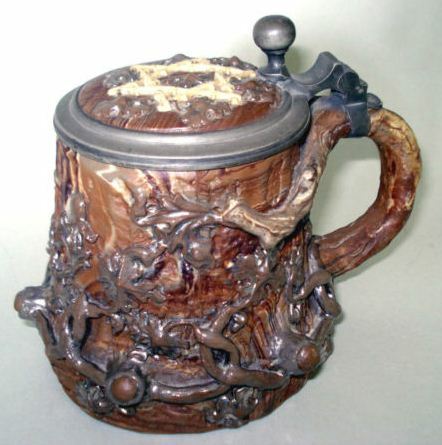 – Elfenbeinsteinzeug is made from exactly the same clay as Steinzeug, but is fired in a vented kiln which allows oxygen to enter the kiln during the process that oxidizes the small amount of iron in the clay causing the beige or ivory coloration. Rather than being salt glazed, Elfenbeinsteinzeug is covered with a glass frit glaze, safer for the environment and those who produce it. 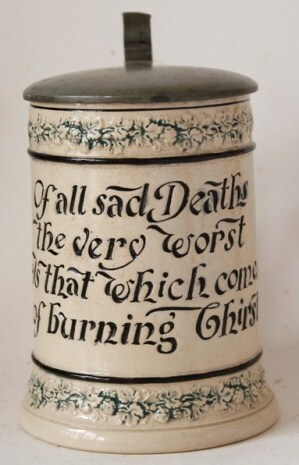 From: http://www.thepatriotexchange.com/pss/pottery.htm Shown ▲: An example made by Ditmar. 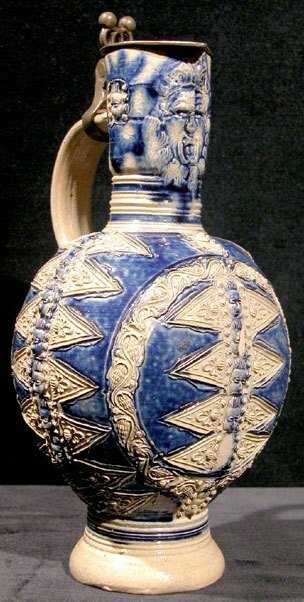 Called Majolica by most collectors because of the applied bright glaze. 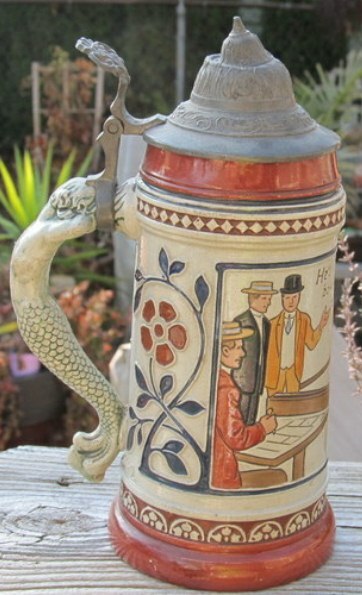 What definition goes with this stein? 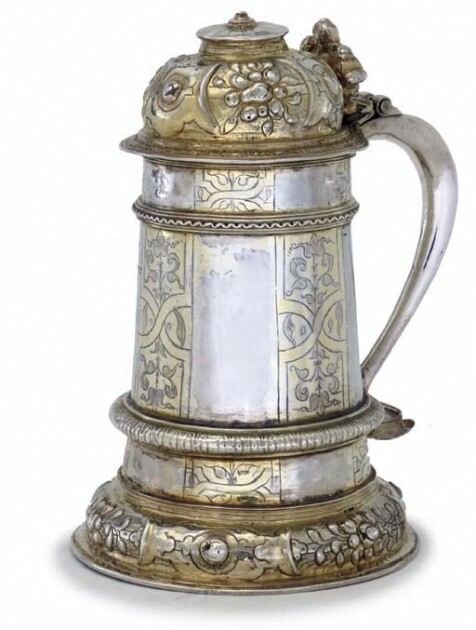 Elizabethan style tankards / steins – Silver pieces made during the reign of Elizabeth I in England. Almost all of them take the form of the one shown above ▲. Extremely expensive as most of them are in museums. Only a handful of these exist outside of museums. I held one in a NY city silver shop about 20 years ago. The price then was only $85,000.00! This one above was estimated in 2002 by Christies, New York, to sell for 80 to 120k, BPS [about $125,215 to 187,822.] and while I don’t know for certain, it probably did! 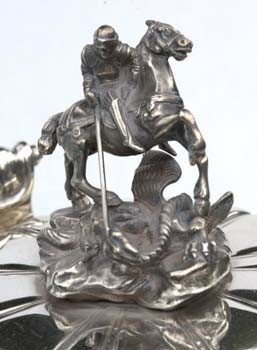 Elkington and Co. – England’s largest silver plating firm. It started in 1840. 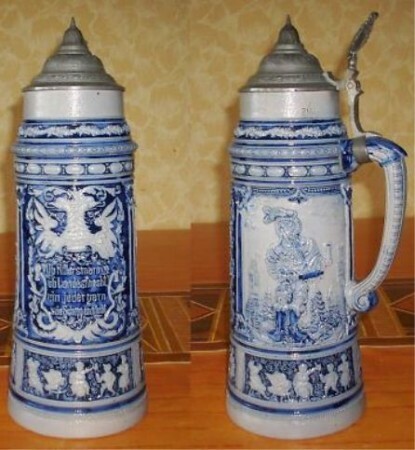 They made historic reproductions of lots of “in museum” steins. 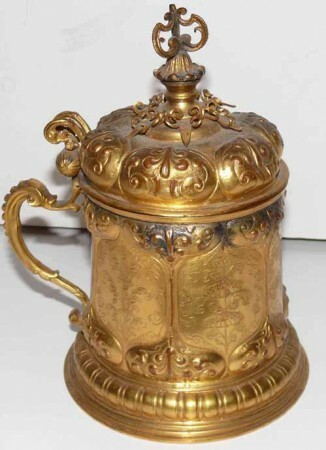 Shown above ▲: A gilded silver “Electro-type” (see just above) reproduction by Elkington of a 1600’s gilded silver stein. Shown above ▲: A much larger copy of an older piece. Very close in style to the one shown on the Oil-on-canvas shown as the header to this page..
Elkington is not as well known for its work in sterling , but they did produced some great looking pieces. This giant (and weights a ton) beer server was the center piece on the meeting room table at some Saint George;’s Society Fellowship hall. [Stephen Smith collection]. Detail of the above finial . ; also sterling. 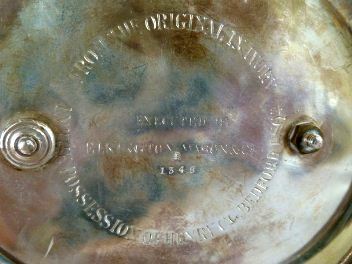 The circular inscription says: “COPIED FROM THE ORIGINAL ………..IN THE PROCESSION OF …”, Elkington Mason and Co. (and stamped mold No.) 1348. Embossing — Similar to repoussé in appearance, but used mainly to create relief designs achieved in one action, such as those impressed by a shaped metal die. 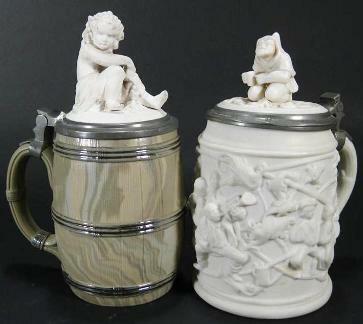 This is used sometimes to describe “relief” steins which are molded not embossed. 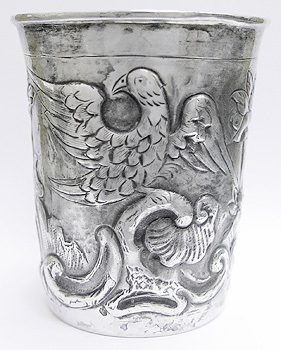 Shown: A Hanau made pressure stamped, silver stein called “hand made and relief “by a USA Stein auctioneer in 2014. The only part of it that was hand made was the silver soldering of the seam, and subsequent cleanup. Enamel — Enameling is an old and widely-adopted technology, for most of its history mainly used in jewelry and decorative art. Applies to several processes of painted decoration, usually on glass or metal, and then fired. Originally made of crushed colored glass. Vitreous enamel, also porcelain enamel in US English, is a material made by fusing powdered glass to a substrate by firing, usually between 750 and 850 °C (1,382 and 1,562 °F). The powder melts, flows, and then hardens to a smooth, durable vitreous coating on metal, or on glass or ceramics. Enameled glass is also called “painted”. Fired enamelware is an integrated layered composite of glass and metal. 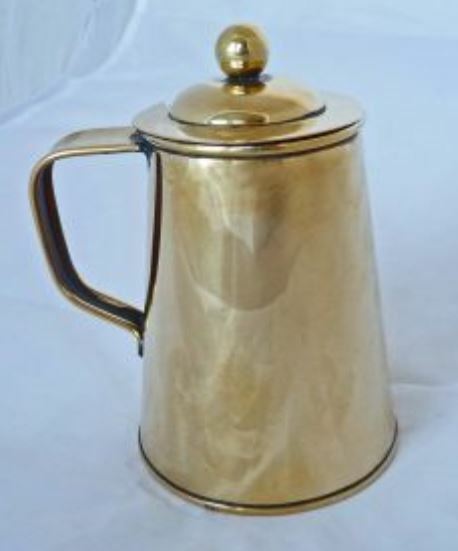 Used as a noun, “an enamel” is a usually small decorative object, coated with enamel coating. 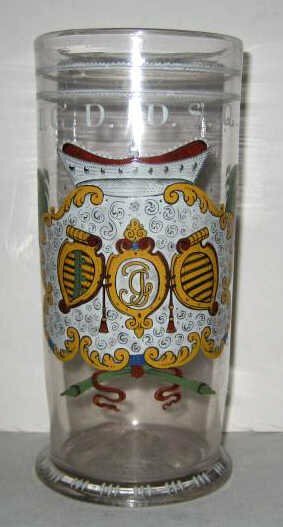 A great example of a “painted enamel” stein. Bohemian. A one liter blown glass stein. Circa 1780 – 1820. Detail of the  flat handle of blown glass with “pig tail” and  the unfinished “pontil mark” which indicates a late 1700’s date. 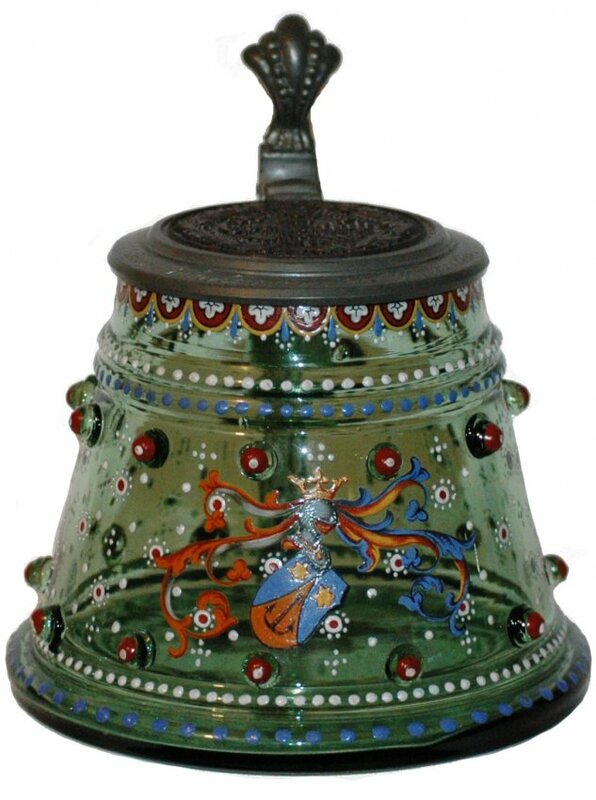 Since the 19th century the term “Enameled” applies also to industrial materials and many metal consumer objects, such as some cooking vessels, dishwashers, laundry machines, sinks and tubs, etc. Enamel steins, baked – The other name for kitchen pots/ pans produced this way is “spatter -ware.” These are hand painted touch up PUGs on an enameled tin body; made like a thermos, with the inside cup coming down into the body and no closed base so the air can circulate around it. The one shown ▲ has had a full metal base added later. German, one liter. Circa 1900. “Endangered Species” beer stein series – Made for Budweiser, this is one of the few new steins series I think is worthwhile, mainly for the message it is trying to establish but the art work is fairly good also. Now if they had only included sharks, whales and yellow fin tuna that the fxxxxxx orientals AND A LOT OF AMERICAN assholes are decimating, I’d be much happier! 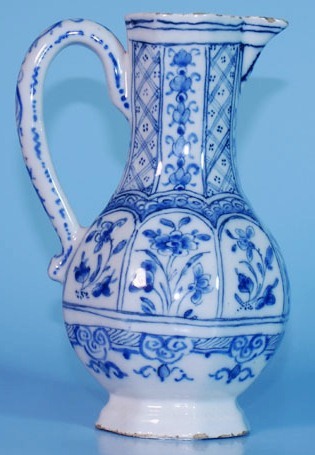 Enghalskrug (Germ) [or] Enghalskanne – “Narrow neck jug.” Shown left: A Westerwald example from the mid to late 1600’s. Shown below ▼: One in fayence, from Hannover [?] I am pretty certain, without looking at it that this is a newer version designed after the old, it is too folksy! 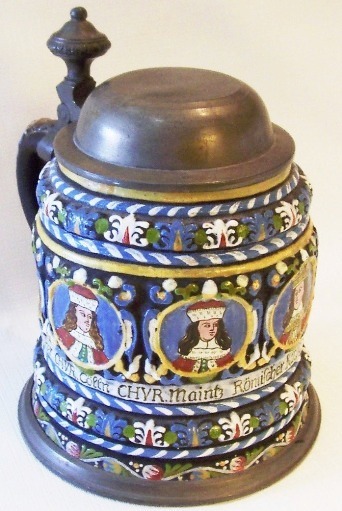 English style steins (tankards . – This subject is for those very new to the drinking vessel collecting game . 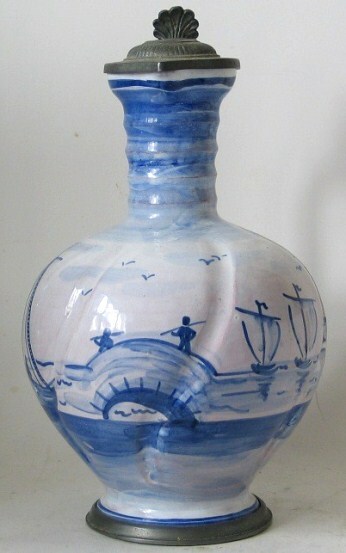 The English styles for vessels are 95% completely different from those on the European Continent. And once established have remained fairly constant for years. 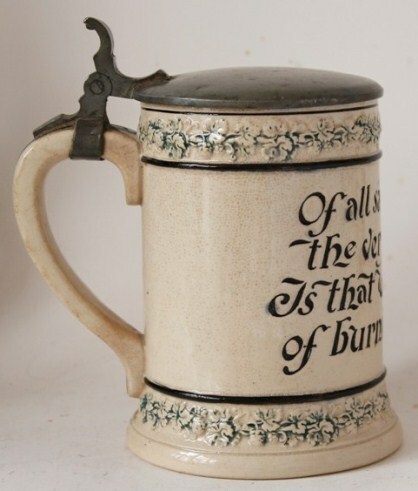 Starting at the earlyiest examples shown above under “Elizabethan style tankards / steins” Once the major forms are learned it will be possible to spot an English example from across the room at a shop or mall and be able to quickly make up ones mind if one wishes to see it. 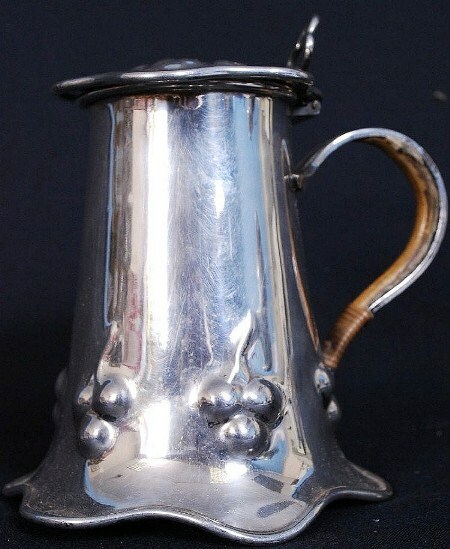 A populat style for Silver and brass – which was well thought of in England in the late 1600 and 1700’s which is when this piece probably was produced. most are marked. The lid is attached by a very small hinge and soldered directly to the top rim body. The English coppersmith ▲was Henry Loverridge. Ca. 1800. 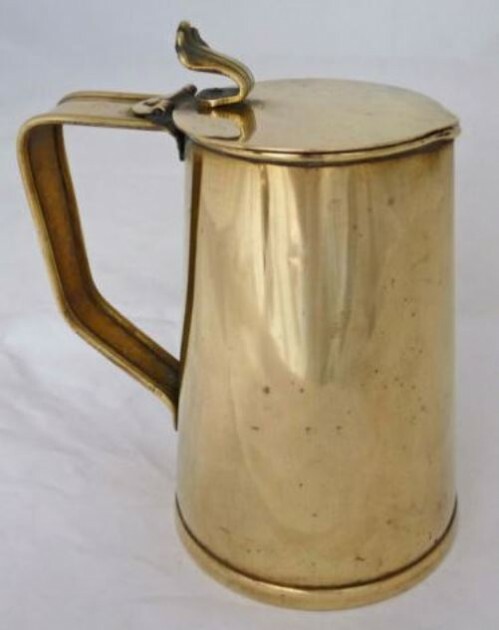 A nice simple design brass tankard / server by Joseph Sandkey. A friend of mine , a member of Gambrinus Beer Stein Collector’s Club had his two Girls learn German in school and he participated by getting into a program where a female German teenager would come over to the States for a year to be a paid Nanny (A-pare. SP?). The next year it would be another girl ,and so on. One particular young lady really hit it off with his family and so when Bill and his wife went to Germany they stayed with the Nanny’s family. He had me be on the look out for him to find some English versed stein for presents as a interesting turn around on gifts. I thought that was a novel idea! “He’d rather bowl than eat!” German but made for the American / English speaking markets. Ca 1900. Why the mermaid handle? I do not know as it has no significance to the scene. Engraved –  Metal – The process of using a hard steel tool to cut into the surface of metal or wood to make a design of words or pictures. 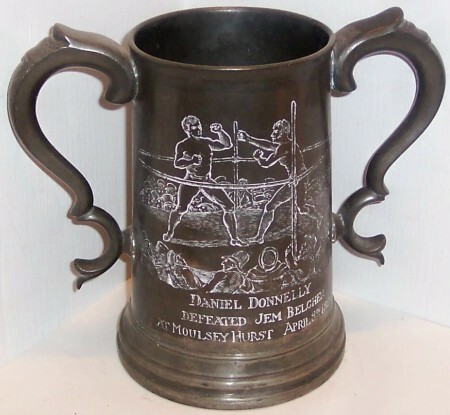 Shown: A great example of an engraved scene and names of the boxers, on a two handled pewter “pass cup” (Loving Cup in England.) The engraving was highlighted with chalk by the owner, Mr. Berg. The story on this great fight can now be found on these web pages. The process of using, most often a copper wheel or a diamond point tool, to grind into the surface of glass to make design or words. The Bohemians in the early to mid 1800’s were masters of doing this. Shown: I have blown the photo up so one can see the great amount of detail one can see. A small dog can be seen in the right foreground by a standing man . This was all engraved on a 3 inch cartouche, on the front of the 6 inch body! EPC — Electroplate on copper. EPBM — Electroplate on Britannia metal. EPWM — Electroplate on white metal [spelter]. Error steins – Goof-ups, Friday’s steins, etc. 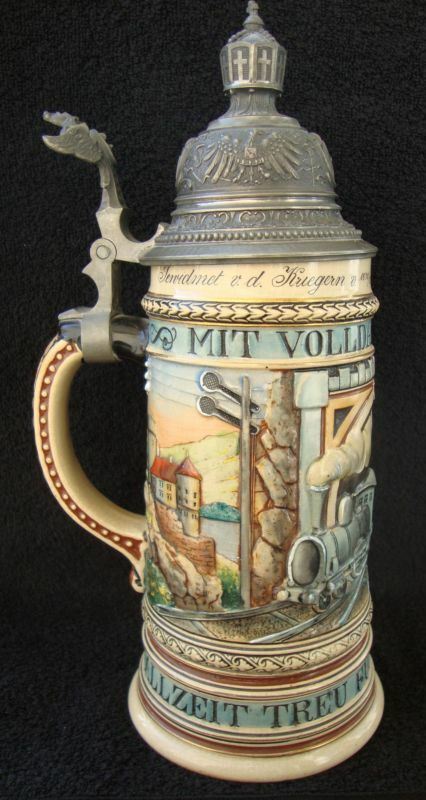 Simply steins showing an error in design or execution. 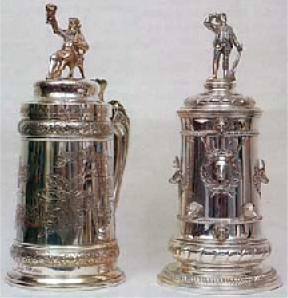 How many of these steins does one think were made before someone realized there were only 11 stripes shown on the US’s flag? They do shown 45 stars, which makes the stein made somewhere between January 1896 (Utah) and October 1907 (Oklahoma), assuming the dumb asses had counted the number correctly from a model! Any of my readers have, or seen a corrected copy? 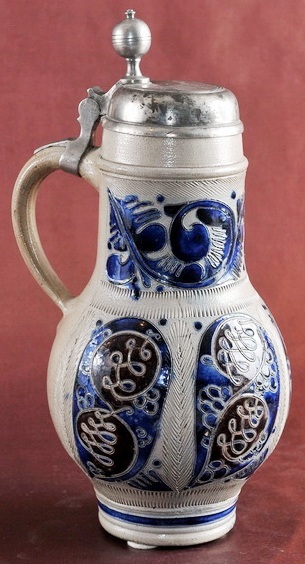 V&B Mettlach stein, .5L, 1732, etched, inlaid lid. 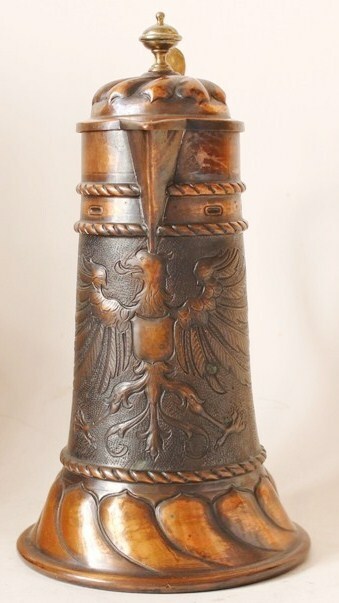 This stein has the correct shield and display for the Prussian Eagle. Notice the silver quarters are (always) to the top left and bottom right. 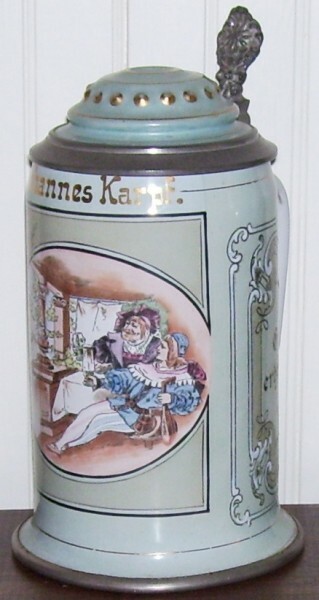 V&B Mettlach stein, 1.0L, 2204, decorated relief, inlaid lid,. 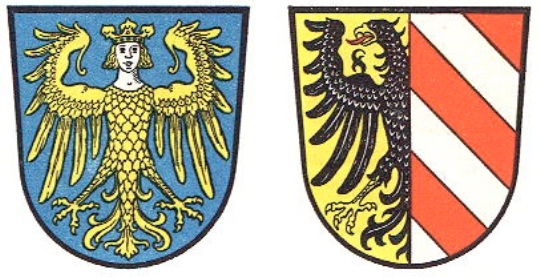 Incorrect colors of the “quartered” shield (white represents silver) of the Prussian eagle, which placed on the Imperial Eagle’s chest. The two above show one good example of an error stein. 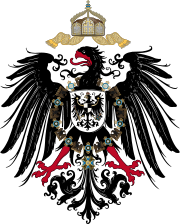 As Prussia was the dominant state in Germany after 1871, so then the Imperial German Arms were of a larger eagle with the Prussian Eagle on its chest. One will notice that for some reason the colors on V & B stein No. 2204, just above ▲, were reversed. Poor quality control! Below ▼: Another good example of not getting the colors in the right location. In official heraldry any item that is engraved and not painted onto, then red is shown with incised vertical lines. The colors are not shown correctly. On the plate’s shield’s left side (facing the reader always), from top to bottom is: white, red. white, red, white, red. Whereas on the official arms the colors always were started with red on top ending in white on the bottom! As this 9 inch pewter plate was probably made as a souvenir, the buyer probably didn’t know any better, but I wonder how it could have slipped through the master of the shop though? Anything for a Mark or two, even back then. Or giving them the benefit of doubt, perhaps as a learning tool? My 42 year old son is in shape …….. Round is a shape isn’t it?